12" is nicer if you like to stand. You don't have to stoop as low. But sitting is better, and the 12" will need an adjustable chair, tall if the observer is not tall. Well after much lively discussion, and with consultation with my finance minister (spouse)...I have decided that the ES 12" truss Dobson is in my future. Will be looking on CN and other dealers for a deal and hope to have finances in place within a couple of months! My 8" Sky-Watcher will be my quick set up scope and the ES 12 will be my detail scope when good stable weather prevails! Thanks for all the comments! Well I think that’s a great choice if you have the 8” the 12” is a nice bump. I recommend you get a coma corrector it really is a game changer. I would definitely budget for one. The Parcorr is #1 but the ES HRCC works flawlessly with the ES dobs. I can’t get over what a difference it makes in my 10”. I have yet to understand why many move their Dobs in one piece. It just makes what could be an easy, relaxed job more awkward and difficult. There are unique situations like Gary's where he moves it frequently throughout the night and has quite a distance to go . But for setup and tear down, it's just one more trip and takes but a minute or so. But. . With a bit of thought and planning, working with the scope rather than fighting it (see above ) the difficulties associated with larger scopes can be reduced . Most Meade 12" and Orion 10" do not have wheel barrow handles. How should that dodge trees? Lay the OTA in the dirt while you move the base? Balance the OTA on the variable height chair? Put it back in the car? Or wait an hour for the object to move out of the trees? I like bring able to just pick up and go look at what I want, when I want. Edited by stargazer193857, 04 February 2019 - 12:13 PM. "I have yet to understand why many move their Dobs in one piece. It just makes what could be an easy, relaxed job more awkward and difficult. There are unique situations like Gary's where he moves it frequently throughout the night and has quite a distance to go . But for setup and tear down, it's just one more trip and takes but a minute or so. " I move my 8” in one piece. It’s pretty easy for me to peak up a paltry ~45lbs. Now when I move to a 12”, then it’s time to add the wheels or at least two a two trip move. But for an 8” it’s more work (for me) to do two trips than one. Edited by Biggen, 05 February 2019 - 07:05 AM. Always 2 pieces for me. However many times. And then eyepieces case & chair, making 3. Same with tripod mounted scopes, OTA on its own, tripod & mount, eyepieces. Just a drill I do instinctively. Because the mounts don't take extra weight well like a dob mount. Changes the equation. GEMs are heavy. Also, SCT come with more native magnification. With a bigger fast newt of same focal length, you have to use a stronger eyepiece to get the extra mag. At equal magnification, more aperture is needed to wow. Edited by stargazer193857, 07 February 2019 - 12:20 AM. Of course, mainly because of the mounts, that make sense. Thanks stargazer. 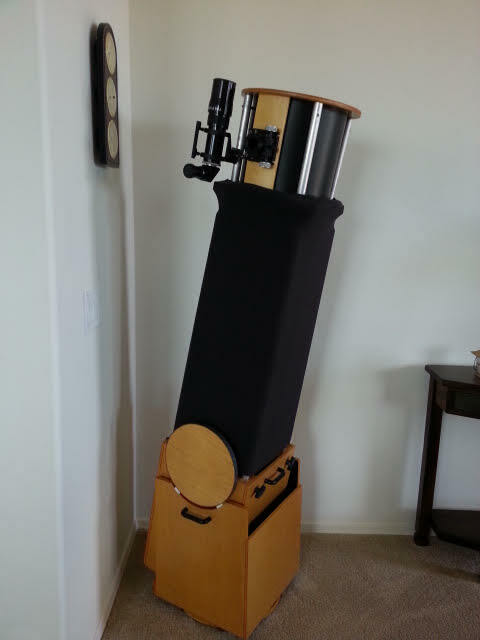 There is the Meade 10" SCT as well to consider. If a scope is too big or too awkward, it's unlikely to get much use. Very true, but I find there can be creative ways to make them less awkward. A few years ago I was forced to move into a small apartment on the ground floor of a 3-story building, so I bought an Orion 70mm refractor so I could easily take up to the roof. But because of its small aperture and the light pollution of Los Angeles I usually only used it on the moon. I rarely used my Meade 8" SCT anymore because I figured it would be too much trouble, so for quite awhile it just sat in its case. But then I constructed a 3-wheeled dolly so I could easily roll it, already assembled on its tripod, down the hall to the parking lot, and I began using it again. But the parking lot has lots of traffic noise and no privacy, so a couple years ago I rigged up some 1.5 inch wide nylon straps to the tripod and optical tube to help me carry them to the roof. One at a time, of course, so it takes two trips, but it's worth it. I've used it up there many times now, and I again have enough aperture to observe more than just the moon. With my 8 I take it in 2 pieces from my shed to the patio where I set up. I can lift things, carrying stuff doesn't bother me. The tube and base is awkward and it finds a way to bump into things. Also carrying stuff across a lawn in the dark is tricky. You can screw up less with a lighter and smaller piece. Edited by sickfish, 08 February 2019 - 08:47 PM. Congrats on the 12" IMO the Goldilocks scope... I was convinced to go from my 8" to a 12" when I saw the Orion Nebula side by side at a star party. Man that thing in the 12" just seemed to go on forever in the 12" with details galore... I USED to think it looked great in my 8". I revisited M42 this year with my own 12" and even side by side with the 8" . Yes there still is that big of a difference. But on some of the other objects, as others have mentioned, not so much of a difference. Yes a difference, but not as jaw dropping as M42 and most globs. I actually prefer the views of some of the larger open clusters with my 8" and its ~<1000mm FL. A few weeks before I got the 12" an old friend and neighbor stopped over with her early 20 something daughter while I had the old Coulter 8" out. At first they asked what I was doing with a canon in my yard. No really, they did. I showed them Jupiter in my 8" and planed on a few globs, and a few others objects I can't remember. They though that Jupiter was cool and all, and were kind of meh on M13 so I didn't go to any more globs. Saturn wasn't up yet, at least not before they went to bed. The daughter was more interested in the other assorted forgotten objects I showed that night, and mom kinda lost interest and started playing with her phone. Yea, just the opposite of what you would expect. So yes you will see the difference in the 8" and 12" scopes. From my light polluted yard about 5 miles from Greater Pgh Airport, my neighbors did without being told it was all that different other than not being the same one, and this was only the 1st and 2nd times they ever looked through a telescope... and a week or so before that I had to convince them my old Coulter 8" wasn't a cannon. That put a thought in my head...maybe the 10" would be used more if I don't have to stand...I do like that about the current 8" I have! The price is much more affordable too! Thoughts? That is the only way i would buy a Dob if it will fit thru the door all set up and get it out in one trip. I rolled a complete 18"F/5 Tectron out the door, to bad the mirror was a flop or i would have kept it. If it is too much work i won't use it. Up to you, but I enjoy sitting, too. I am usually at the eyepiece for long periods of time. Price is another consideration. A 10" is a capable aperture in the right hands, a 12" even more so especially over the 8" you currently own. Tough choice, but weigh the benefits...there are other things to consider other than aperture. Comfort and ease of movement and set up are two of them. Cost is another, and so on. Strike that balance and you have a good scope you will use and enjoy using it. I really don't see any difference in terms of sitting versus standing between a 10 inch F/5 versus a 12 inch F/5. Both are too short to allow standing and both are best when the observer sits on an adjustable chair such as the Starbound. This thread is about 8, 10 inch and 12 inch Tube Dobs... For large Dobs, moving them in 2 pieces is difficult.. I just use a simple plastic chair that happens to be a good height for an 8" and maybe a 10". They are cheap and shipping is expensive here. So far, my experiments buying an ultralight 8” scopes or lightening an 8” factory scope haven’t turned out well. I found that reducing the weight of a scope is EASY, but doing so without introducing other serious problems is difficult, which is one reason mainstream scopes weigh what they do. So, if someone offered me a 30# 10” Dob, I would be more than a little skeptical about its performance, and wouldn’t consider buying it without doing a thorough hands-on evaluation first. Nice to know. What sort of problems did the light weight ones have? Would you need to inspect it yourself if a big name poster did so first? I initially went with a lightweight strut setup when I moved from the solid-tube structure on my XT10. The new strut structure was very well constructed, but I found that mounting equipment to the structure was a weak point. For example, rather than having a full upper tube assembly (UTA), the "UTA" was a single wooden ring. The focuser installed to a metal plate that was attached on its top edge by two bolts to the bottom of the wooden ring. With larger eyepieces and/or when using an eyepiece plus a Barlow, I got focuser flex. I also found that the lack of UTA surface made mounting/aligning finder scope challenging. Also, getting a full shroud on the strut OTA was challenging. For these reasons I decided to move on to a heavier truss design with a full-sized UTA to allow more solid mounting of focuser and finders. I also wanted a more robust mirror-box-installed primary cooling solution than what was practical on the ultralight structure and wanted a cleaner implementation for an OTA light shroud and for installed power and dew control. The heavier structure made all of this easier. Even so, I am a believer in the connection between scope ease of use and frequency of use. I also agree that there is probably no cure to aperture fever if WOW is the only objective and that working to make the greatest use of available aperture is the most sustainable and rewarding long-term pursuit. These considerations (plus the fact that I knew the 10" primary I already had was well-figured) led me to stay with a 10" aperture rather than moving to 12.5" or making the next "one magnitude jump" up to something like a 16". My cure for aperture feaver is wanting to fit some common sized objects in an 82 deg fov at a magnification that is unlikely to be affected by the atmosphere and with an exit pupil that is not likely to be vignetted, say 6mm. So 80x and 6mm is 480mm of aperture, or 19". So 20" is as big as I'd want, if transportation and viewing comfort were not issues. Although, there are many more smaller galaxies half the size that would benefit from 40", and a 100 deg eyepiece can help find them. However, 8-12" frames 1.25 ish deg with a 4-5mm exit pupil, and is very comfy to sit by and easy to transport. And as Jon points out often, big fast scopes have big sevondaries. They get thicker, too. Edited by stargazer193857, 16 February 2019 - 12:01 PM. Good luck on your decision. You are not alone here. It's hard to go wrong, in general. One other factor may be the seeing and transparency where you live. Atmospheric conditions are not to be sneezed at. If you experience regular atmospheric turbulence, you may want to stay with the 8" to reduce the effects of turbulence (good links are cleardarksky.com for a forecasted observing chart for your area, courtesy of the Canadian Meteorological Center, and arksky.org for explanations of atmospheric effects on observing). I suggest mirror quality is important too, and a mediocre 12" may disappoint (I was unable to split the double-double, or Polaris, at 170X in a scope made by a popular manufacturer). ES quality may vary a bit more than you might expect with advertising -- you may get a great mirror or a not-so-great one. This is likely shared with most other mirrors made in the People's Republic. Many custom mirror makers can possibly test and refigure your mirror, though. A 12" will not only be clumsier and generate more cuss words as you move it, it will also be more subject to winds. As for standing to view in a 12", it still is a stopping contest at 45 deg. I even bent my knees to look in 18" f4.3. My best view ever of M82/M81 was through a 10" f5, seemed comfortably. I sit in an adjustable office chair at all day. The high position becomes uncomfortable after 30 minutes tops. And that chair is padded. That's why I keep declining Jon's offer to get a 16" and a cat's perch. 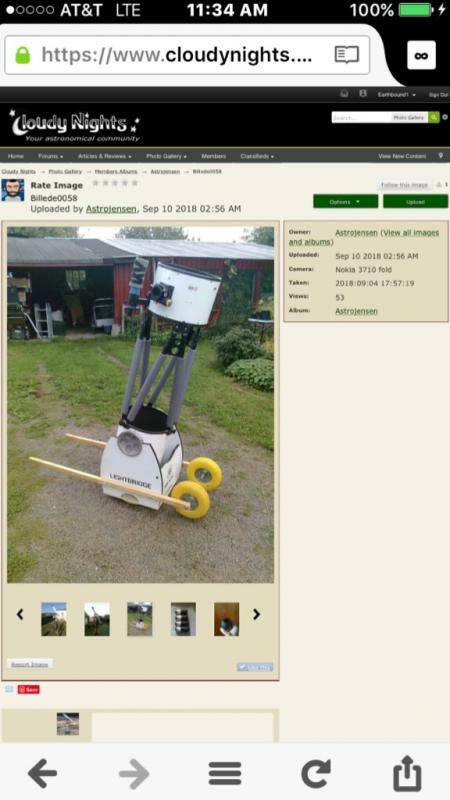 Here's a screenshot of Astrojensen's Meade dob with pneumatic wheels and wood handles. I would've made it a single axel with "notches" on top of the handles instead of bolting through them, so I could drop them and the scope and then move the handles out of the way... I really like his design and it has inspired me to "improve" upon it by thinking of how the handles could be made to be removable. I dig those yellow easy to see tires!!! Edited by Earthbound1, 17 February 2019 - 12:48 PM.